Team roping is a timed event. Team roping is the only event in rodeo where two men actually compete together. The cowboy on the left side of the chute holding the steer is called the header, and the one on the other side is the heeler. It might seem a bit obvious that the header catches the head of the steer while the heeler must catch the hind legs, but there is more to it. Both legs must be caught. If only one is roped there is a five-second penalty added to their time. For the header, there are only three ways he can get a legal catch; he must either rope both horns, rope around the neck, or rope one horn and the head. 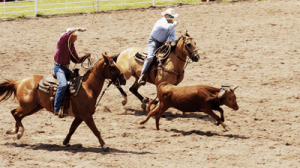 When both the head and the heels are caught, the time does not stop until both horses are facing each other and there is no slack in either rope. And as with steer wrestling, breaking the barrier results in 10 seconds being added. If either man misses, the team receives a no score.